In 2007 and 2009, the political consultant was paid $ 1.2 million. The information about at least two payments to the former advisor to Donald Trump, Paul Manafort, contained in the so-called "black ledger" of the Party of Regions, has found confirmation, Associated Press reported on 13 April referring to a document on transfers to the consulting firm of the former chief of Trump's campaign. Manafort's consulting firm received two payments in 2007 and 2009 for at least 1.2mn dollars, which is in line with the data contained in the handwritten ledger that featured records about unofficial payments by the Party of Regions, the agency reports. In March 2017, Verkhovna Rada deputy Serhiy Leshchenko said that in 2009 Ukraine via offshore firms made a transfer of $ 750 thousand to the consulting firm Davis Manafort. The ostensible purpose of the payment was the purchase 501 computers. Leshchenko insisted that the payment was fictitious and the money was intended for Manafort. Manafort and his representative Jason Maloni said in response that the data were fabricated. Commenting on the information on the deal, the ex-head of Trump's campaign headquarters denied the authenticity of signatures on payment documents and insisted that he has never sold any computers. AP says it obtained an invoice that shows a transaction worth $ 750 thousand, dated October 14, 2009. The invoice was issued to the address of the company Neocom System Ltd, registered in Belize at that time. The record contained the account number, routing number and mailing address, which coincided with the data of the Manafort account in one of the banks in Virginia. The information about the transaction coincides with the entry in the "black ledgers" of the Party of Regions, indicating the name of Manafort. Another payment of $ 455 thousand, documented by the agency, was made in November 2007 by Graten Alliance Ltd, registered in Belize. It also coincides with the entries in the "black ledger", AP says. In the comments to the agency, Manafort did not deny that his company has received these funds, but stressed that any wire transfers to his company were legal fees for the political advice he provided. Manafort added that he had given his account details to his clients, and payments had been made through a wire transfer to an American bank. According to him, the payments were made according to his "clients' preferred financial institutions and instructions." As reported by Reuters, Manafort was planning to register with the US Department of Justice as a foreign agent. Manafort is said to have ended working for foreign clients long before he started working for Trump. "Since before the 2016 election, Mr. Manafort has been in discussions with federal authorities about the advisability of registering under FARA for some of his past political work," Manafort's representative told Reuters. 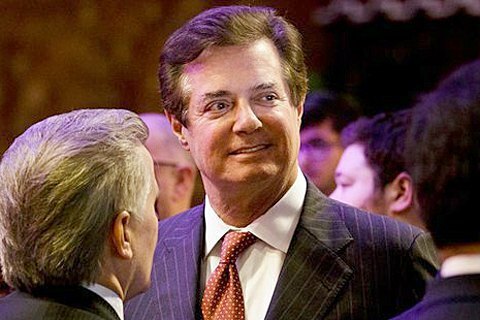 Last August, Paul Manafort had to resign from Trump's campaign amid the scandal that broke out after a New York Times publication that revealed some details of his work in Ukraine as a key advisor to Yanukovich, who fled to Russia in February 2014. According to the New York Times, the "black ledger" of the Party of Regions of Ukraine contained records of undeclared cash payments to Manafort totalling 12.7mn dollars in the period from 2007 to 2012. Manafort himself stated after this publication that any wire transactions received by his company were "legitimate payments for political consulting work that was provided." 67-year-old lobbyist and political strategist Paul Manaforte was an active participant in the American election campaigns of the last four decades and advised, in addition to Trump, to various candidates from John McCain and Bob Dole to both Presidents Bush. Among the foreign clients of Manafort, in addition to the overthrown Ukrainian President Viktor Yanukovych, were odious characters like Filipino dictator Ferdinand Marcos and Bahamian Prime Minister Linden Pindling, accused of links with drug lords.